Come From Away, whose cast is pictured here, is one of many musicals competing for attention in Broadway's current surge of openings. Matthew Murphy / Courtesy of Polk and Co.
Movie fans know that Hollywood opens its most prestigious films every December, right before the Oscar nomination deadline. The same is true of Broadway — except it happens in the spring, before the Tony nominations come out. This year's is an exceptionally crowded season, with 18 shows — half of them musicals — opening in March and April. Last season was all about Hamilton. Everyone knew it was going to win the Tony for best musical, but Barry Weissler, who produced Waitress, didn't care. "They were a super hit, and we even had some of our investors begging us to delay for a season," Weissler says. "'Go to Chicago,' one of them said, 'and then come in.' "
But Weissler already had a theater and a cast — and even though Waitress didn't win a single Tony Award, it turned out to be a profit-making hit. While Weissler gambled, though, other shows decided to skip last season. Some of them are opening before the Tony deadline this spring. Scott Mallalieu owns GreatWhiteWay.com, a company that sells Broadway tickets to groups. He says that on Broadway, timing can define success. "The general rule of thumb is you don't wanna open a show in the fall, 'cause even if it gets good reviews, it's sometimes forgotten by the rush of all the new, fresh stuff in the spring," he says. But Mallalieu thinks that rule of thumb may not hold this year because there are already three hit musicals that opened in the fall: Dear Evan Hansen; Natasha, Pierre & The Great Comet of 1812; and A Bronx Tale. That means there's not a lot of room for new shows to become hits, according to Jeremy Gerard, the theater critic for Deadline, who's been on the Broadway beat for four decades. He says all of those new shows — some of them literally opening one day after another — are fighting for a piece of a relatively small pie. "The producers know there's gonna be a bloodbath," Gerard says. "The total size of the Broadway audience is not all that fungible and, in fact, the numbers are going down. The grosses are going up — the amount of money coming in — because you've got these insane ticket prices, now being led by Hamilton, with its $849 top ticket. So, the grosses are all out of whack, [but] the actual audience numbers are going down." Still, in a business where one in four Broadway shows fails, hope springs eternal, and producers try every trick they can to make their shows stand out. Sometimes, they'll hire a star, like Bette Midler in Hello Dolly! — or they'll adapt a popular movie, like Groundhog Day or Amelie. But some musicals, like last fall's Dear Evan Hansen, get lucky without any of that. That could be true of this spring's Come From Away, an original Canadian musical set in Newfoundland after Sept. 11, 2001, when American airports were shut down and locals played host to 7,000 stranded passengers. Sue Frost, Come From Away's lead producer, says it wasn't a sure bet. "It was a title that no one understood; it was an ensemble piece, so no stars; and people were gonna call it 'the 9/11 musical' — so, it was, like, three strikes!" Frost says. But by opening a little earlier this spring, Come From Away may have a chance to break out of the pack. Weissler, who successfully took on the Hamilton juggernaut last spring with Waitress, says having big hits for competition can be a good thing. "A rising tide floats some boats — not all boats," he says with a laugh. "There are a few boats that sink. But a rising tide does help it; it helps the Broadway scene." Maybe you're thinking about spring break, maybe a trip to Broadway is on your wish list. If so, you will have a lot to choose from. This year is an exceptionally crowded season with 18 shows, half of the musicals opening in March and April. And just as Hollywood often releases films in December right before the Oscar deadline, Broadway does the same in the spring before the Tonys. Jeff Lunden reports. JEFF LUNDEN, BYLINE: Last season was all about "Hamilton." Everyone knew it was going to win the Tony for Best Musical, but Barry Weissler who produced "Waitress" didn't care. BARRY WEISSLER: They were a super hit, and we even had some of our investors begging us to delay for a season. Go to Chicago, one of them said, and then come in. LUNDEN: But he already had a theater. He had a cast, and even though "Waitress" didn't win a single Tony Award, it turned out to be a hit, and it's made a profit. But other shows decided to skip last season, and some of them are opening before the Tony deadline this spring. SCOTT MALLALIEU: The general rule of thumb is you don't want to open a show in the fall because even if it gets good reviews, it's sometimes forgotten by the rush of all the new fresh stuff in the spring. LUNDEN: Scott Mallalieu owns greatwhiteway.com, a company that sells Broadway tickets to groups. He says the rule of thumb may not hold this year because there are already three hit musicals which opened in the fall. MALLALIEU: "Dear Evan Hansen" - certainly a major contender, the front contender for awards season, "Great Comet" - also right up there and "A Bronx Tale." LUNDEN: Which means there's not a lot of room for new shows to become hits. JEREMY GERARD: The producers know there is going to be a bloodbath. LUNDEN: That's Jeremy Girard the theater critic for Deadline who's been on the Broadway beat for four decades. He says all of these new shows - some of them literally opening one day after another - are fighting for a piece of a relatively small pie. GERARD: The total size of the Broadway audience is not all that fungible. And in fact, the numbers are going down. The grosses are going up, the amount of money coming in because you've got these insane ticket prices now being led by "Hamilton" with its $849 top ticket. So the grosses are all out of whack. The actual audience numbers are going down. LUNDEN: Still, in a business where 1 in 4 Broadway shows fails, hope springs eternal. So producers try every trick they can to make their show stand out. Sometimes they'll hire a star like Bette Midler in "Hello Dolly" or they'll adapt a popular movie like "Groundhog Day" or "Amelie." LUNDEN: But sometimes they get lucky without any of that. Last fall, it was "Dear Evan Hansen." 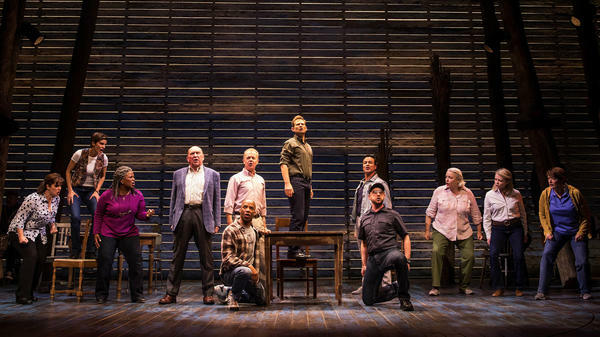 This spring, it could be "Come From Away." UNIDENTIFIED ACTOR: (As character, singing) Welcome to the Rock. If you come from away, you probably understand a half of what we say. They say no man's an island, but an island makes a man especially when one comes from one like Newfoundland. UNIDENTIFIED ACTORS: (As characters) Welcome to the Rock. LUNDEN: It's an original Canadian musical set in Newfoundland after 9/11 when American airports were shut down and locals played host to 7,000 stranded passengers. Sue Frost, the lead producer says it wasn't a sure bet. SUE FROST: It was a title that no one understood. It was an ensemble piece, so no stars. And people were going to call it the 9/11 musical, so it was like three strikes. LUNDEN: But by opening a little earlier this spring, "Come From Away" may have a chance to break out of the pack. Producer Barry Weissler who successfully took on the "Hamilton" juggernaut last spring with "Waitress" says having big hits for competition can be a good thing. WEISSLER: A rising tide floats some boats, not all boats, so there are a few boats that sink. But a rising tide does help the Broadway scene. LUNDEN: No matter how crowded. For NPR News, I'm Jeff Lunden in New York. Transcript provided by NPR, Copyright NPR.